Hardcover, 9 x 6.75 in. / 268 pgs / 271 color. Text by Friedrich W. Heubach, Thomas A. Lange, Hans-Jürgen Lechtreck, Sonja Pizonka. 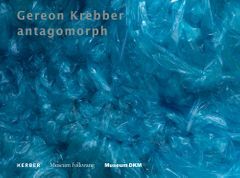 From large-format sculptures to installations and art-in-architecture projects, Antagomorph presents Gereon Krebber’s (born 1973) newest works. Texts, drawings and an annotated index of material offer a detailed overview of the Cologne-based artist’s sculptural work of the last five years. Text by Leni Hoffmann, Gereon Krebber, Aoife Ruane. Text by Stephan Mann, Uwe Schramm, Susanne Wedewer. FORMAT: Hbk, 9 x 6.75 in. / 268 pgs / 271 color.